I never rejoice in the death of anyone, but there are some people who because of their body of life’s work that I will not miss. Phyllis Schafly is one of them. 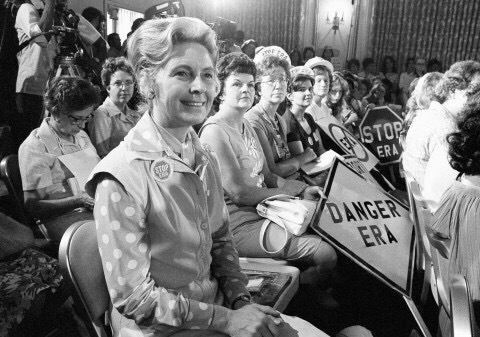 She was one of the leading religious agitators who fought to deny equal rights to women by stopping the passage of the Equal Rights Amendment which by an act of Congress would have guaranteed women the same rights as men, and to the end of her life was a strident opponent of equality for LGBTQ people, and immigrants. But there is always a price for such foolishness. Schafly and her allies in the political Christian Right who so desired to bring about the Kingdom of God by attempting to both subvert the Constitution through biased religious lawmaking, by demonizing her opponents, and by denying the very source of life of our nation, the proposition that all men are created equal actually helped destroy the real spiritual influence of the Christian faith in the United States more than anyone. They sold their birthright, discredited the church, and for what? The illusion of political power and influence. A few years back the Barna Report, a very reputable Evangelical Christian polling organization noted that the fastest growing segment of the American religious mosaic was “the nones,” people who have no preference in religious belief, and the fastest growing subsets of the “nones” are Atheists, Agnostics, and Free Thinkers. In fact number one of the reasons cited by Barna is that a vast majority of young people, including those who grew up in the church, described the church as too political. A February 2016 study by Barna noted that almost half of non-religious Americans view Christianity as extremist, and dangerous. That should trouble any Christian leader, but it never bothered Schafly or for that matter any of her political preacher allies. Likewise according to a Barna study released in October 2014, nearly half of the ever rising number of “the unchurched” find it hard to name a single positive contribution of the church to society. Throughout her life Phyllis Schafly made her money and fame by demonizing all opposition, she rallied supporters by promoting fear, and she, maybe even more that the Elmer Gantry types of charlatan political and prosperity preachers is in large part responsible for the current sad state of the Christian church in the United States. I remember back in the late 1970s and 1980s the hold that she had on churches that I attended. She was practically deified for her opposition to women’s rights, and LGBTQ people. 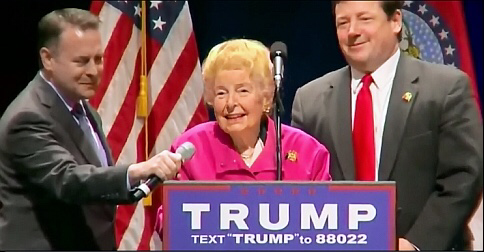 She could be found at the side of any political hack willing to give her a place in the podium almost to the day she died, even this summer she appeared at the side of Donald Trump, as always casting the pearls of the Gospel at the feet of a man whose life and work exemplifies the complete opposite of what was once considered Christian virtue. When I learned of Mrs Schafly’s death I was watching an episode of The Blacklist. Reddington made the comment “you know what my problem with religion is? Man. Like anything that has potential to be beautiful, man will turn it into somethings ugly.” I could not help by think of the irony. Schafly spent her last year nearly destroying the Eagle Forum organization that she helped to found by endorsing Trump, a man who she called “the last hope for America” even as she filed a lawsuit against nephew Tom from trademarking his Schafly Beer because she was the person who made her name famous. Truthfully, like I said, I never rejoice in the death of anyone, even someone like Mrs Schafly whose actions I believe we’re so detrimental to so many people and to the church itself. I pray that she finds God to be more merciful to her than she was to others, and I do hope after a life spent demonizing and denying the rights of people that she despised, I hope that her tortured and embittered soul finds some measure of peace that she seemed unable to find in life. She was a very sad, sick lady. You call her a ” tortured and embittered soul”. Although I have not generally followed her except review during the ERA amendment attempt and now again on the news, she never appeared that way to me. She appears genuinely happy in every video or photo I have seen of her, so much so her eyes twinkle, she shows delight, jests and laughs easily as shown in a short blurb from an interview she had years ago with an ERA proponent with a famed author and host William F.Buckley Jr. A recent news article said pigs blood was thrown on her and Betty Friedman said she wished she could burn her at the stake. It seems odd you see her as a tortured and embittered soul after I read one article (your commentary on the cause of death of David Wilkerson) of yours. The photos and videos I have seen of her do not come across as your depiction at all. Lest I get pigs blood thrown on me and someone’s desire to burn me at the stake, I leave my email and name as notsaying. You could be right Mr or Mrs “Notsaying.” Coming to look at those pictures she may not have been tormented at all. Now as for what happened to her years ago didn’t condone it then as I wouldn’t condone it now, after all when you see the all the death threats thrown out by supposedly religious conservatives at anyone who the disapprove of your those who oppose them I don’t find threats funny, nor even talk of wanting to do it. You see I have been subject to those threats myself from supposed “Christians” as well as White Supremacists. One was so specific I had to report it to the FBI and another to the Air Force Office of Special Investigations. So please don’t give me this crap about someone possibly throwing pigs blood on you. Now as far as her happiness, maybe you are right, in which case she was a sociopath incapable of empathizing with the targets of her rabid discrimination. Maybe I should revise the article to be less charitable and call her a sociopath rather than a tortured and embittered soul. Though I actually thought of writing the article that way I decided to be a bit more charitable, but the fact is your comments don’t help her reputation one bit in fact they make her seem truly evil. But then, religion often does that to people. Sorry you feel that way and I wish you well with nothing but blessings. Wish I had not commented. Please delete all my comments.